The Bend Metropolitan Planning Organization is the group that decides where federal transit money goes in our area. 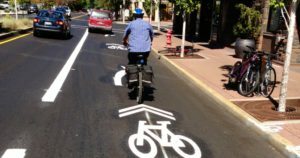 The group has wide latitude in deciding how to spend that money and has historically split funds between maintaining our roads and ensuring we have a varied and reliable transportation infrastructure that keeps your commute short. Unfortunately, the new chairman of the planning board – City Councilor Bill Moseley – appears to be taking a shortsighted view that sees public transit as being in conflict with basic road maintenance. In a council meeting last night, he strongly indicated his opposition to meeting funding commitments for transit, using potholes as an excuse to bury other obligations. To be sure, road maintenance is a top priority. But it is not the only priority for the community and cannot be addressed at the exclusion of other transit needs. It affects your children playing on bikes, mobility for the elderly and disabled, how we grow from a town to a city – and your commute time. The MPO planning board is holding a public meeting Friday morning, March 17, at 10am in the County Commission Chambers at 1300 Wall Street in Bend.